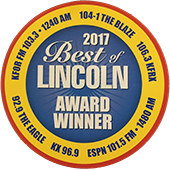 Andy’s Appliance Repair & Parts House is factory authorized to provide warranty and non-warranty appliance repairs for old and new Bertazzoni appliances for the good folks of Omaha. We are Bertazzoni certified, for warranty and non-warranty repairs alike. We continue training so that we keep sharp and keep current with new technology as well as the new appliances introduced to the market. We continue to train and learn so that we bring the most skilled and current technicians to our customers in Omaha. 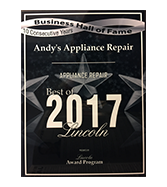 If you are in need of residential appliance repair on appliances like ovens, warming drawers, ice makers, dishwashers, fridges, washing machines, dryers, and more, Andy’s Appliance Repair represents an ideal blend of quality and value. We are factory certified in most brands, types and models. We don’t charge you an arm and a leg to get the job done the right way. 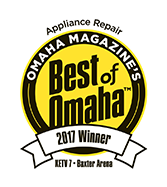 We’ve been serving Omaha, Lincoln surrounding communities and beyond with quality kitchen and laundry appliance repair for over 45 years, so it’s safe to say we have an understanding of what this industry demands as well as what our customers demand. We conduct ourselves with what we call a “guest mentality” approach when our Certified Technicians are in your home. This means we treat your home, your belongings, your pets and YOU with courtesy and respect. Just like we would want to be treated. We do our very best to provide an exceptional service experience. We protect your home by putting on “booties” over our shoes before ever stepping inside your house, we place our tools on padded blankets so that we protect surfaces from scratches while keeping it clean. 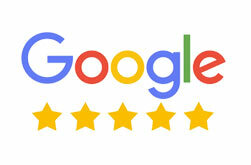 People have come to trust Andy’s Appliance service because we are reliable and we care. We stand by our 2- hour appointment windows that we’ve made. An example of this commitment is we won’t ring your doorbell when we come to your place, just in case there are any little ones laying down for nap time!